Recent changes to the TU Alert system focus on the use of the TU Siren. On Friday, Oct. 14, after a shooting occurred in a residential home on North Warnock Street, just northeast of 11th and Berks streets, a TU Advisory notice was sent via e-mail to inform students, faculty and staff of the incident. On Sept. 3, the Office of President Ann Weaver Hart approved changes to the TU Alert system, which provides students, faculty and staff with vital information in the event of a campus emergency through one of three ways: a TU Advisory, a TU Alert or the TU Siren. “What we’ve tried to do is create a system that’s flexible enough so we can relieve the uncertainty associated with certain activities,” Executive Vice President and Chief Financial Officer Anthony Wagner said. One major change to the Emergency Communication Policy was deciding how and when the TU Siren should be used. The siren will only sound when there is a threat to the health and safety of the Temple community, such as dangerous weather or the release of hazardous material. “It’s meant to tell you to hunker down,” Wagner said. However, Wagner said the siren would not be used in the case of an on-campus shooting. “The siren wouldn’t be most effective in the case of a shooter,” Wagner said. Another important change is the distinction between a TU Advisory and a TU Alert. A TU Advisory is “used to communicate information regarding an incident that occurs on or around campus that is deemed significant, yet does not warrant immediate action,” according to the policy. TU Advisories are sent as an e-mail message from the TU Alert system with the word “advisory” in the subject line. TU Advisories are “about making sure the community has information so they don’t wonder what’s going on,” Wagner said. “It’s so likely that wrong information will be communicated like wildfire,” he added. TU Alerts, according to the policy, are used to communicate “information regarding an incident that occurs on or around campus that is deemed an emergency requiring immediate action on the part of the campus community.” The alerts are sent as e-mails, text messages and automated phone calls. Now that a definite policy is in place, Wagner said he and others in the Office of the President are focused on informing students about the system, for which they must be signed up in order to receive notifications. While 46,168 Temple e-mail addresses are on file, the president’s office confirmed that less than 30 percent of students, faculty and staff are signed up to receive the messages on their cell phones. The next step in the plan to educate students about the TU Alert system is producing a video similar to the professionally produced message in use at the University of Maryland, Wagner said. Wagner’s other concern is using the system too often. “The concern with being too aggressive in using the advisories is you don’t want it to become routine. If it becomes routine, [students might] blow it off,” Wagner said. Students who receive the alerts seem to appreciate the information. “I like it a lot because it warns me of everything that’s important,” said Cecilia Spencer, a sophomore kinesiology major. 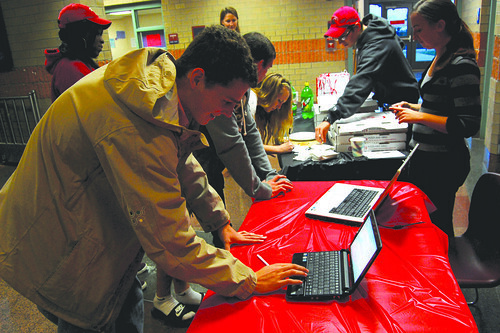 While Joseph Madanat, a junior biology major, questioned the usefulness of the e-mails, except in the case of a student who doesn’t have a cell phone, he said he thinks the system is important. “I definitely think an alert system is important for dire situations, especially in this area,” Madanat said. Julia Held, a freshman biology major, agreed. “I think it’s important that students be signed up for an alert system that can keep them safe in the case of a Virginia Tech situation or something equally dangerous,” Held said. Cell phone numbers can be registered quickly through OWLnet, Wagner said. Rosella LaFevre can be reached at rosella.lafevre@temple.edu.